The 2018–19 UEFA Europa League is the 48th season of Europe's secondary club football tournament organised by UEFA, and the 10th season since it was renamed from the UEFA Cup to the UEFA Europa League. All statistics correct as of 18 April 2019. The final will be played at the Olympic Stadium in Baku, Azerbaijan. The winners of the 2018–19 UEFA Europa League will earn the right to play against the winners of the 2018–19 UEFA Champions League in the 2019 UEFA Super Cup. They will also automatically qualify for the 2019–20 UEFA Champions League group stage, and if they have already qualified through their league performance, the berth reserved will be given to the third-placed team of the 2018–19 Ligue 1, the 5th-ranked association according to next season's access list. For the first time, the video assistant referee (VAR) system will be used in the competition, where it will be implemented in the final. As the title holders of Europa League, Atlético Madrid qualified for the 2018–19 UEFA Champions League, although they had already qualified before the final through their league performance. They are unable to defend their title as they advanced to the Champions League knockout stage. On 9 December 2016, UEFA confirmed the reforming plan for the UEFA Champions League for the 2018–2021 cycle, which was announced on 26 August 2016. As per the new regulations, all teams that are eliminated in the UEFA Champions League qualifying rounds will get a second chance in the Europa League. Moreover, 55 teams eliminated from the 2018–19 UEFA Champions League are transferred to the Europa League (default number is 57, but 2 fewer teams compete in the 2018–19 UEFA Champions League). For the 2018–19 UEFA Europa League, the associations are allocated places according to their 2017 UEFA country coefficients, which takes into account their performance in European competitions from 2012–13 to 2016–17. In the default access list, originally 17 losers from the Champions League first qualifying round are transferred to the Europa League second qualifying round (Champions Path). However, one fewer loser would be transferred since the Champions League title holders already qualified for the group stage via their domestic league. Therefore, only 19 teams entered the Champions Path second qualifying round (one of them would be drawn to receive a bye to the third qualifying round). The cup winners of association 18 (Denmark) entered the third qualifying round instead of the second qualifying round. The cup winners of association 25 (Norway) entered the second qualifying round instead of the first qualifying round. The cup winners of associations 50 and 51 (Wales and Faroe Islands) entered the first qualifying round instead of the preliminary round. Notably one team that is not playing a national top division takes part in the competition; Vaduz (representing Liechtenstein) played in 2017–18 Swiss Challenge League, which is Switzerland's 2nd tier. ^ Albania (ALB): In March 2018, Skënderbeu Korçë was handed a 10-year ban from UEFA club competitions over match fixing. Since they finished as champions of the 2017–18 Albanian Superliga, the runners-up of the league, Kukësi, entered the 2018–19 UEFA Champions League instead of the 2018–19 UEFA Europa League. As a result, their Europa League first qualifying round berth was given to the fifth-placed team of the league, Partizani. ^ Armenia (ARM): Shirak would have qualified for the Europa League first qualifying round as the fourth-placed team of the 2017–18 Armenian Premier League, but were penalized by the Football Federation of Armenia for match fixing, and subsequently informed UEFA their withdrawal from competing in the Europa League. As a result, the berth was given to the fifth-placed team of the league, Pyunik. ^ Estonia (EST): FCI Tallinn would have qualified for the Europa League first qualifying round as the fourth-placed team of the 2017 Meistriliiga, but were disbanded and merged with Levadia Tallinn after the season. As a result, the berth was given to the fifth-placed team of the league, Narva Trans. ^ Italy (ITA): Milan qualified for the Europa League group stage as the sixth-placed team of the 2017–18 Serie A, but were originally banned by UEFA from European competition due to violations of Financial Fair Play regulations. They appealed to the Court of Arbitration for Sport, and the ban was overturned on 20 July 2018. ^ Kazakhstan (KAZ): Ordabasy would have qualified for the Europa League first qualifying round as the third-placed team of the 2017 Kazakhstan Premier League, but failed to obtain a UEFA licence. As a result, the berth was given to the fifth-placed team of the league, Tobol. ^ Moldova (MDA): Dacia Chișinău would have qualified for the Europa League first qualifying round as the fourth-placed team of the 2017 Moldovan National Division, but were disbanded after the season. As a result, the berth was given to the fifth-placed team of the league, Zaria Bălți. ^ Montenegro (MNE): Grbalj would have qualified for the Europa League first qualifying round as the fourth-placed team of the 2017–18 Montenegrin First League, but failed to obtain a UEFA licence. As a result, the berth was given to the fifth-placed team of the league, Rudar Pljevlja. ^ Portugal (POR): Desportivo das Aves would have qualified for the Europa League group stage as the winners of the 2017–18 Taça de Portugal, but failed to obtain a UEFA licence. As a result, the third-placed team of the 2017–18 Primeira Liga, Sporting CP, entered the group stage instead of the third qualifying round, the fourth-placed team of the league, Braga, entered the third qualifying round instead of the second qualifying round, and the second qualifying round berth was given to the fifth-placed team of the league, Rio Ave.
Cork City were randomly drawn to receive a bye to the 2018–19 UEFA Europa League third qualifying round. 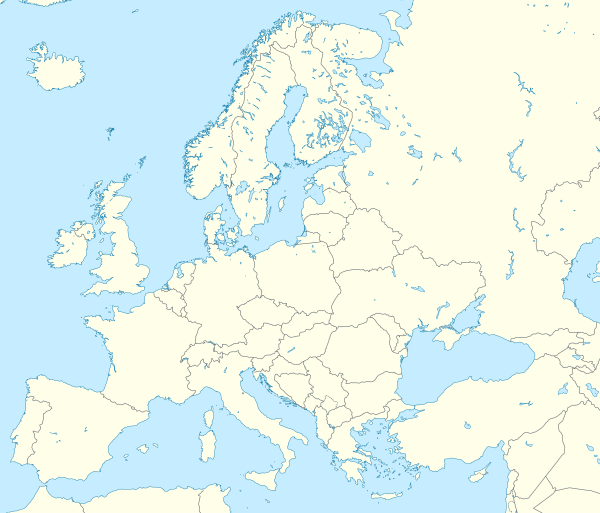 Derry City are a club based in Northern Ireland, but participate in the Europa League through one of the berths for the Republic of Ireland (any coefficient points they earn count toward Republic of Ireland and not Northern Ireland). ^ Russia (RUS): Tosno would have qualified for the Europa League group stage as the winners of the 2017–18 Russian Cup, but failed to obtain a UEFA licence. As a result, the fourth-placed team of the 2017–18 Russian Premier League, Krasnodar, entered the group stage instead of the third qualifying round, the fifth-placed team of the league, Zenit Saint Petersburg, entered the third qualifying round instead of the second qualifying round, and the second qualifying round berth was given to the sixth-placed team of the league, Ufa. ^ Wales (WAL): Bangor City would have qualified for the Europa League preliminary round as the runners-up of the 2017–18 Welsh Premier League, but failed to obtain a UEFA licence. As a result, and because the third-placed team Connah's Quay Nomads were Welsh Cup winners, the berth was given to the fourth-placed team of the league, Bala Town. From this season, the kick-off times starting from the group stage will be slightly changed to 18:55 CET and 21:00 CET. Kick-off times starting from the quarter-finals will be 21:00 CEST. In the preliminary round, teams were divided into seeded and unseeded teams based on their 2018 UEFA club coefficients, and then drawn into two-legged home-and-away ties. Teams from the same association could not be drawn against each other. The draw for the preliminary round was held on 12 June 2018. The first legs were played on 26 and 28 June, and the second legs were played on 5 July 2018. In the qualifying and play-off rounds, teams are divided into seeded and unseeded teams based on their 2018 UEFA club coefficients (for Main Path), or based on which round they qualified from (for Champions Path), and then drawn into two-legged home-and-away ties. The draw for the first qualifying round was held on 20 June 2018. The first legs were played on 10, 11 and 12 July, and the second legs were played on 17, 18 and 19 July 2018. ^ a b c d e Order of legs reversed after original draw. The second qualifying round is split into two separate sections: Champions Path (for league champions) and Main Path (for cup winners and league non-champions). The draw for the second qualifying round (Champions Path) was held on 19 June, and the draw for the second qualifying round (Main Path) was held on 20 June 2018. The first legs were played on 26 July, and the second legs were played on 31 July, 1 and 2 August 2018. The third qualifying round is split into two separate sections: Champions Path (for league champions) and Main Path (for cup winners and league non-champions). The draw for the third qualifying round was held on 23 July 2018. The first legs were played on 7 and 9 August, and the second legs were played on 16 August 2018. The play-off round is split into two separate sections: Champions Path (for league champions) and Main Path (for cup winners and league non-champions). The draw for the play-off round was held on 6 August 2018. The first legs were played on 23 August, and the second legs were played on 30 August 2018. Location of teams of the 2018–19 UEFA Europa League group stage. The draw for the group stage was held on 31 August 2018 at the Grimaldi Forum in Monaco. The 48 teams were drawn into twelve groups of four, with the restriction that teams from the same association cannot be drawn against each other. For the draw, the teams are seeded into four pots based on their 2018 UEFA club coefficients. In each group, teams play against each other home-and-away in a round-robin format. The group winners and runners-up advance to the round of 32 where they are joined by the eight third-placed teams of the 2018–19 UEFA Champions League group stage. The matchdays are 20 September, 4 October, 25 October, 8 November, 29 November, and 13 December 2018. A total of 27 national associations are represented in the group stage. Akhisarspor, Chelsea, F91 Dudelange, Jablonec, Rangers, RB Leipzig, Sarpsborg 08, Spartak Moscow and Spartak Trnava made their debut appearances in the UEFA Europa League group stage (although Chelsea, Rangers, RB Leipzig and Spartak Moscow have already competed in the UEFA Europa League knockout phase after a third place in the UEFA Champions League group stage, while Rangers and Spartak Moscow have appeared in the UEFA Cup group stage). F91 Dudelange is the first team from Luxembourg to play in either the Champions League or Europa League group stage. ^ a b Goal difference in all group matches: Vorskla Poltava –9, Qarabağ –11. ^ a b Goal difference in all group matches: Olympiacos +5, Milan +3. ^ a b Head-to-head points: Villarreal 4, Rapid Wien 1. ^ a b Head-to-head goal difference: Sevilla +2, Krasnodar –2. In the draws for the round of 16, quarter-finals and semi-finals, there are no seedings, and teams from the same group or the same association can be drawn against each other. As the draws for the quarter-finals and semi-finals are held together before the quarter-finals are played, the identity of the quarter-final winners is not known at the time of the semi-final draw. A draw is also held to determine which semi-final winner is designated as the "home" team for the final (for administrative purposes as it is played at a neutral venue).